Jindy Web Design was created to help local businesses and individuals get their business or that super cool idea online. The world wide web is a massive part of our lives these days and having a web presence to show off what you love is absolutely essential. We really love creating cool places online through web design and social media platforms so you can display to the world all the amazing services you have to offer. We take a very simplified approach to designing your website so it’s extremely easy to navigate, has a clean professional look and feel and will be a website you’ll be super proud to show off. At Jindy Web we have spent a serious amount of time filtering through information, blogs and design services to bring to you an enhanced toolbox of tips and tricks to get your business looking professional and ready to click and share. The amazing things that you can do once you have the site set up is endless. Promoting your business through social media to get the word out and linking your site is easy as 1, 2, 3. Linking up your social media for instant site updates even adding a Blog so you can keep clients and potential new customers in the loop with the happenings of your business world. We are also planning to bring an online training platform as part of our services for clients who want to take a little more hands on approach to their website. The training will be a place for our clients to view guides and how to’s to get the most our of their shiny new website. 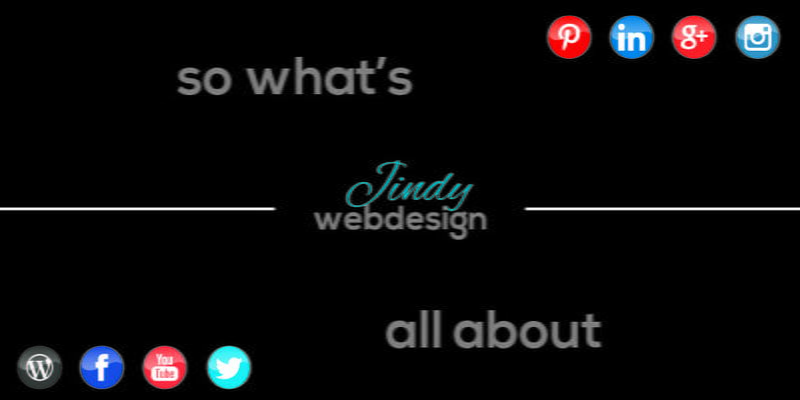 If you’ve always wanted to get a website for your business idea but didn’t quite have the budget, time or know how, nows the time to contact Jindy Web Design. Let’s catch up for a coffee and a chat to discuss what we can do for you and your amazing business idea.